Each month respectmyplanet.org (RMP) recaps oil & gas activity in the Michigan Basin right here in our Michigan Oil & Gas Monthly (MOGM) magazine. RMP is a Michigan based 501(c)3 non-profit organization. If you want to know what’s going on with oil & gas development in Michigan, you should follow this publication each month by liking us on facebook or following @respectmyplanet on Twitter so you don’t miss a publication. This is a screen shot from Bill Harrison’s paper linked in this article about the location of three of the “J-style” Antrim wells targeting the Upper Devonian Lachine, Paxton, and Norwood layers of the Antrim Shale. Delta Oil’s ACOWS targeting the same formation with multiple horizontal drainholes are closer to the county line of Montmorency & Alpena Counties. Click image to enlarge on your screen. In September, we saw some interesting activity in the Michigan Basin that we will keep our eyes on as it unfolds. Delta Oil out of Oak Brook, Illinois filed numerous ACOWS to drill multiple horizontals off of their State Avery D1-32 well (PN45601) & off of their State Albert A4-1 well (PN53617). The ACOWS calls for a horizontal drainhole (HD) targeting the Upper Devonian Lachine formation. The other ACOWS calls for an HD targeting the Norwood formation. The 3rd ACOWS adds a sump-pump in the Traverse formation. Both wells call for the exact same ACOWS and this “triple configuration” of two HDs and a sump. 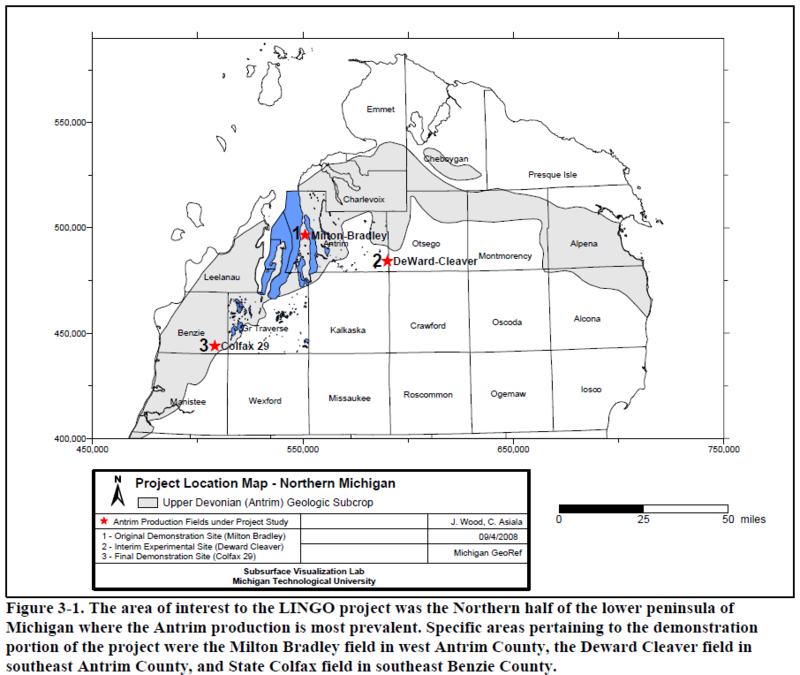 I recall reading one of Mr. Harrison’s papers about the “J-style” wells into Upper Devonian Antrim formations but all the projects Mr. Harrison discusses in the paper linked in the last sentence are on the west side of Michigan. Both of Delta Oil’s wells are on the east side of Michigan. Interesting. We’ll have to check back later to see what happens. Also in September was an ACOWS to hydraulically fracture the State Summerfield 2-18 well which originally targeted the Cold Water Shale in 1988 and has produced 1.2 bcf of natural gas with only 43k gallons of waste water. 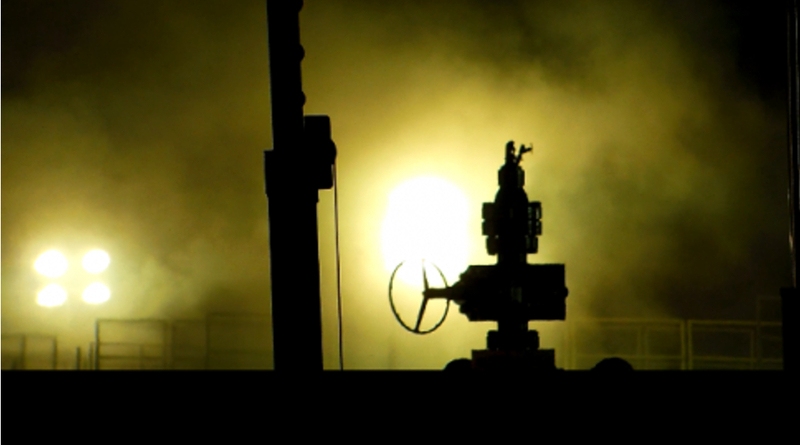 The operator of record for the State Summerfield 2-18 is Cobra Oil & Gas. 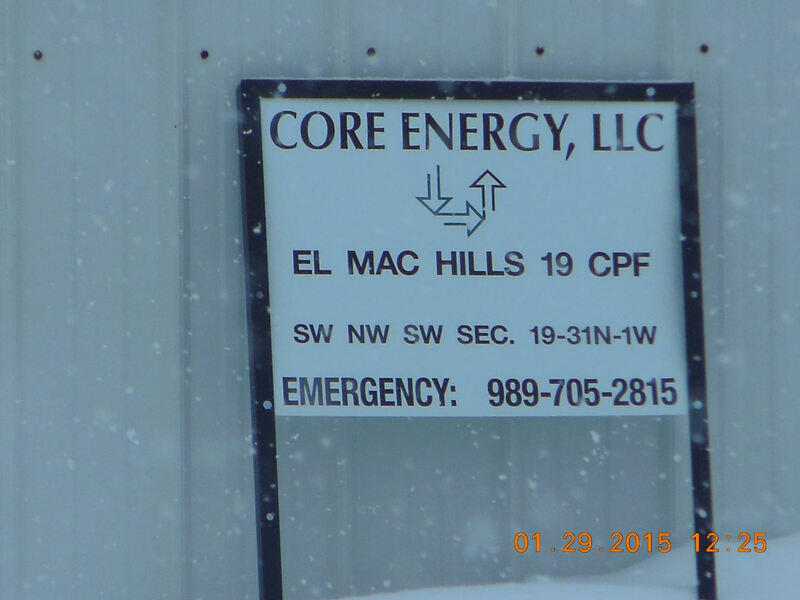 We also saw Core Energy receive permit 61186 for the Chester 8-16HD1 which is in Core’s CO2 flooding area. RMP is working right now on a post about Michigan’s leadership position with Carbon Dioxide Capture & Sequestration (also called by the hashtag #CCS). RMP’s paper about #CCS will be published in early October. #CCS is a big deal and Michigan’s Core Energy LLC is a leader on this front working with the United States Department of Energy and Midwest Regional Carbon Sequestration Partnership. Core Energy’s Dover 33 EOR unit is a U.S. Dept.Of Energy Phase 3 project that has sequestered over 580,000 tons of Carbon Dioxide as of today (over the course of 43 months since the project started). The U.S. Department of Energy only has six Phase 3 projects for #CCS going on in all of North America and Core Energy LLC’s Dover 33 EOR project is one of those six. Michigan truly is a leader in this very important research & development area. You can read our new paper coming out in just a week or two to learn more about #CCS. RMP hopes that people who say they’re concerned about global warming will start to prove it by learning about carbon capture & sequestration. Stay tuned and follow RMP to always be on the cutting edge of sustainable energy & waste management issues in Michigan and around the world. RMP expects that we will have the first six month’s of Michigan production data ready to report next month in October. Ahead of that reporting, however, I thought it would be a good time to look back at all the wells that have come online in Michigan over the past 18 months. If you want to follow developments across our basin, you have to be patient in order to let data accumulate because Michigan oil & gas development is moving at its slowest pace in history. Over the last 18 months, only 23 wells have come online and have been issued production resource unit numbers by Michigan’s MPSC. If we look back on these most recent wells that have come online in the last 18 months and sort them by top producers we see a hodge-podge of companies and locations in Michigan where operators have been able to achieve economic production. There is no single hot spot. 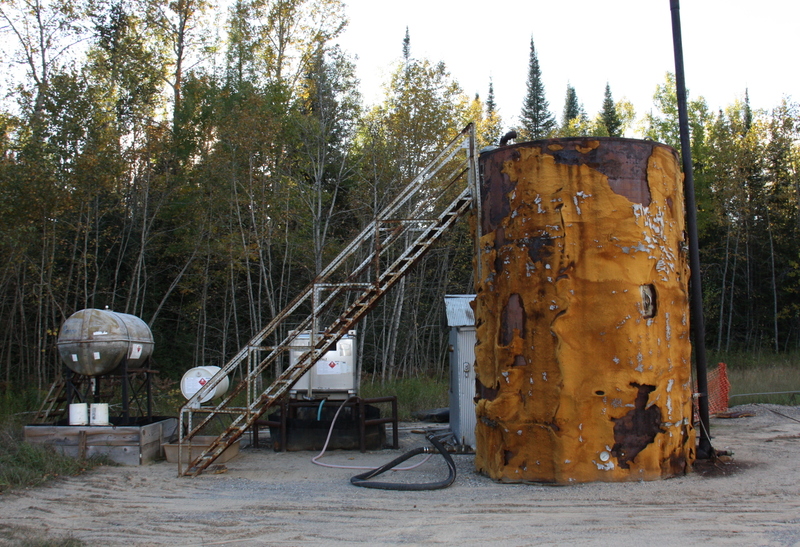 Topping the list of wells to come online in the last 18 months is Core Energy’s State Manistee 2-14 well that has cumulatively produced over 100k bbls of oil from the Niagaran; the well has also produced NGLs and about 150 mcfd of dry gas. That’s an average of about 228 barrels of oil per day. The State Manistee 2-14 is in northern Michigan not too far from the shoreline of Lake Michigan. You can see it on our map by clicking here. Also coming online in the last 18 months is Savoy Energy’s Boyce 4-24 HD1, which has produced about 139 BOPD along with NGLs & dry gas. The Boyce 4-24 HD1 is near Michigan International Speedway and you can see it on our map by clicking here. Axia Energy, out of Colorado, comes in at the #3 spot with their Pease 20-134 well in Climax Township near Kalamazoo. The Pease 20-134 well has produced just over 100 BOPD but has produced no reported NGL or dry gas. 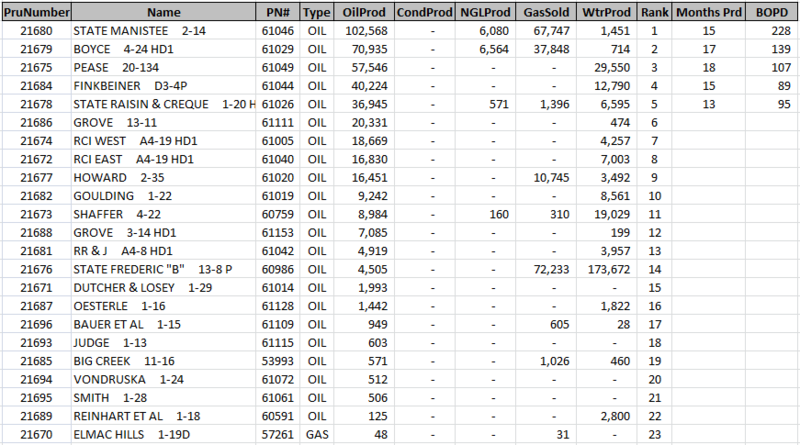 A listing of all 23 wells in Michigan coming online in the last 18 months is shown below ranked by oil produced. The #4 ranked well below is near Ann Arbor on the banks of the Saline River and the #5 ranked well is halfway between Tecumseh & Adrian and is producing near 100 BOPD. For contrast, I thought it would be interesting to mention that an average well drilled into the Permian Basin in Texas will produce over 500 BOPD along with about 900 mcfd of dry gas. Here’s a link to the EIA’s summary on an average Permian Basin well for September of 2016. (Note: the Permian Basin link on the EIA’s page will update to the current month depending on when you read this post). Michigan received 8 applications in September bringing the total number of applications this year so far up to 38. The number skippings you see in the sequential order are application numbers that get used up when operators file ACOWS. RMP does not count ACOWS toward the number of applications filed but it’s pretty irrelevant either way at this point as this is by far the slowest year in Michigan’s history and last year was the slowest year in history before this year. Below are the listing of applications received in September. September oil & gas applications received in September 2016 by the MDEQ’s OOGM. Click to enlarge. In September 2016, the MDEQ’s OOGM issued 12 new permits for oil & gas wells bringing the YTD total up to 31 for 2016. The listing of permits issued in September is shown below. Lines colored in orange are possibly more CO2-EOR wells which RMP is keeping a close eye on. I sent an email to Rick Henderson to confirm if these are CO2-EOR wells so I can add them to RMP’s new #CCS map. September 2016 oil & gas permits issued by the MDEQs OOGM. Click to enlarge. Eleven wells were reported plugged in September bringing the total wells reported plugged in 2016 up to 94. 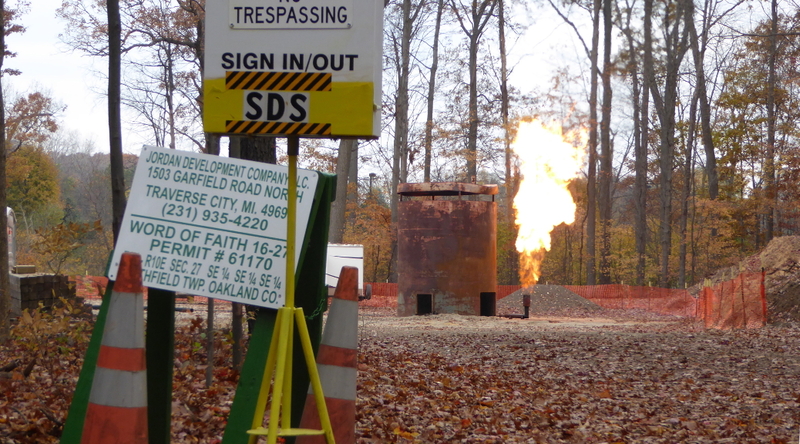 One of the more interesting wells reported plugged this month is the Oakland County Road Commission 1 well on permit #72. September 2016 wells reported plugged in Michigan. Click to enlarge. My thinking on this subject was that, ceteris paribus, the line would trend toward zero because America was producing more oil and by exporting that oil, it would improve our trade deficit with regard to petroleum. As you can see below, there has been a spike upwards over the last couple months which I attribute to Saudi Arabia’s dominance as a global oil producer. Saudi actions to keep production levels high to curb competition are hammering US producers. Even though the trend is as predicted by RMP at the outset of the year, this recent spike reinforces RMP’s underlying economic logic that using crude oil domestically as an energy source is bad for America’s economy and national security over the long haul. American simply cannot compete with producers like Saudi Arabia. We should make the migration to FCEVs to significantly diminish our need for crude oil in the coming years. By lifting the export ban, RMP believes that it is a good thing for America’s economy because we can continue to let our oil workers work and sell oil internationally while we work to displace oil demand domestically with hydrogen by way of fuel cell electric vehicles. America can be 100% energy independent, eliminate energy volatility in our markets, let our oil workers make the changeover gracefully, and improve our economy & national security along the way. To read RMP’s magnum opus on why we advocate for the responsible migration away from crude oil, you can click here. 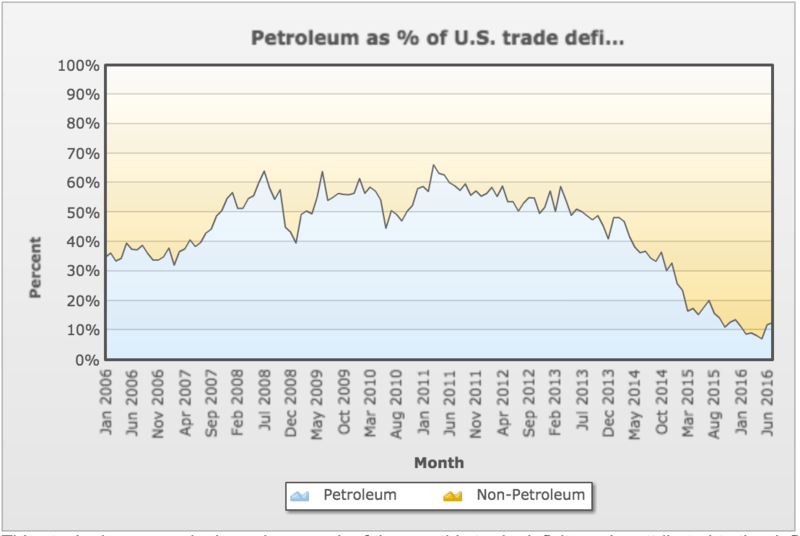 Petroleum as a % of US Trade Deficit for July 2016 comes in @ 12.6%. Data for this KPI lags three months behind the current date. The previous month’s deficit (June 2016) was @ 11.9% which represents a 0.7% month over month uptick. This graph is spiking most likely from the effect of Saudi Arabia’s increased output causing a bust in America. Click to enlarge. That’s it for the September 2016 MOGM. Follow us on Twitter & like us on facebook to keep up with energy news. Thank you for reading. Coming in the next couple weeks is RMP’s Carbon Dioxide Capture & Sequestration post that will explain the process and why Michigan is truly leading the world in this important research and development field.